TheSamba.com :: Vanagon - View topic - Syncro Chat: VC's, solid shafts, decouplers, AWD/4WD, etc. Syncro Chat: VC's, solid shafts, decouplers, AWD/4WD, etc. Posted: Sat Feb 09, 2019 6:18 pm Post subject: Re: Syncro Chat: VC's, solid shafts, decouplers, AWD/4WD, etc. Is the viscous coupling a kind of tesla turbine? Posted: Sat Jan 27, 2018 11:51 pm Post subject: Re: Syncro Chat: VC's, solid shafts, decouplers, AWD/4WD, etc. Agreed Raoul, Thanks for your patience and the reverse engineering. I don't understand why anyone would avoid the full understanding.. They are omitting the reality of tire slip, and it seems "intentional" at this point (pages and pages in) to NOT understand it. a few seem delighted to obfuscate that in order to make it seem like the thing is magic. Sodo is delighted to obfuscate a flawed premise however. The coast side ball tracks (on the front CVs) remain pristine, showing that the Syncro fronts are NOT "braking" a lot. And Sodo is delighted to opine that the drive-side wear on all used Syncro front CVs is PROOF that the Syncro front wheels PULL hard. Do we really have to discuss whether or not Syncro front wheels PULL? Of course they do! And that's why it's a pleasure to drive. It's sure-footed on gravel. Its a Syncro. Syncro fronts pull because of the rear wheel slip. Posted: Sat Jan 27, 2018 11:25 pm Post subject: Re: Syncro Chat: VC's, solid shafts, decouplers, AWD/4WD, etc. Raoul -- perfect and X2. Posted: Sat Jan 27, 2018 10:31 pm Post subject: Re: Syncro Chat: VC's, solid shafts, decouplers, AWD/4WD, etc. A VC is just an automated decoupler, that never completely decouples. It also acts as a coupler, that never completely couples. It is not magic, and does not generate torque on dry pavement, it actually creates drag. This statement is in direct conflict with the simple diagram above. We still haven’t read where this diagram is in error. Simply saying what you think it does with nothing to back it up is not an argument. Describing other transmissions is irrelevant. The “forward torque” side has presented SAE papers, published studies, wear on actual parts, math, diagrams, and descriptions that conform to the laws of physics. The “no-forward torque” side has presented transmissions not installed in a Syncro, examples that omit real world conditions (tire slip), and a “feel” of the fronts braking. Somehow the forward torque side is accused of non-scientific, religious, magical, or biased thought. To some it must matter more to win a discussion than to get to the truth. Posted: Sat Jan 27, 2018 4:42 pm Post subject: Re: Syncro Chat: VC's, solid shafts, decouplers, AWD/4WD, etc. The Jeep VC is used in a completely different fashion from the Syncro. Where the Syncro's default position is uncoupled, NOT transferring torque (only couples with differences in shaft speed), the Jeep's is always transferring torque and its purpose is to reduce binding by allowing small shaft speed differences in a full time 4WD/AWD system. The Jeep VC is also housed in a transfer case, and it has 1 input shaft and 2 output shafts. The Syncro VC only has a single input shaft and a single output shaft which limits its functions. Completely different application. My LandCruisers also have this feature. Great setup. 1987 2WD Wolfsburg Vanagon Weekender "Mango", two fully locked 80 Series LandCruisers. 2016 Subaru Outback boxer. 1990 Audi 90 Quattro 20V with rear locking differential. 1988 Mitsubishi Van w/ dual spinny seats, mid engine and solid axle.1990 burgundy parts Vanagon. 1984 Porsche 944, 1992 Lexus LS400, 2002 BMW 325Xi 5 speed. Posted: Sat Jan 27, 2018 12:00 pm Post subject: Re: Syncro Chat: VC's, solid shafts, decouplers, AWD/4WD, etc. Here is a retrospective, of where we have been, I searched keyword "magic". ... it seems like even the engineers who designed this "magical" viscous coupler are not really sure what it can do. It is just really difficult to hold a prop-shaft in your hand, linked to a working VC, and say it does not transmit torque all the time. It is very simple, yet complex with all the variables. For me the only way to turn it off is to de-couple it. It is like a solid shaft at the beginning, then releases under certain conditions, and then locks up like a solid shaft again. I still have this gut feeling my VC is always transferring torque unless the vehicle is just coasting straight down the road. a center differential is always applying torque to both f/r axles. This is simply because the input shaft from the engine applies torque to both output shafts at all times because it is designed to do that. A VC is designed only to apply torque to the output shaft when a condition applies. That condition is that the input shaft speed is faster than the output shaft. When you are driving straight along a road in a VC Syncro, the front shaft is spinning at the same speed as the rear, with the power to spin the shaft coming from the road passing under the front tires. If you magically removed the VC for an instant, the front shaft would merrily continue to spin along at the exact same speed. It is NOT being driven by the rear input shaft. Zero torque being applied. Back to the center differential. Straight ahead - it is applying torque to the front shaft as well as the rear shaft. It has TWO output shafts and two sets of spider gears and ring gears designed for this. These are two completely different designs and people seem to easily interpret the VC as the same mechanical function. So, as I have mentioned previously, a Syncro driving straight along dry pavement is getting driving torque to its rear tire contact patches. And it is getting mild braking torque to the front contact patches. The behavior of the vehicle starts from there and is not the same as 4 driven contact patches like a Quattro, etc. But the important part is for people to absorb and grasp this state of affairs as the starting point of the Syncro's behavior. The VC is not transferring any torque under the above conditions, and IT IS NOT DESIGNED TO. If the front output shaft is already powered and spinning at the same speed while you drive down the road because of the road under the front wheels passing, and you are on dry pavement, there is no torque being transferred from the rear. The VC is spinning along with zero relative movement inside between the plates and transferring zero torque. Go in to a curve, and the front wheels are spinning slightly faster, meaning inside the VC, the front plates are actually PULLING the rear plates slightly and generating torque to the rear! Heh. And of course that means the front tire contact patches are experiencing slight braking torque in the process to push against the rear contact patches in their unsuccessful attempt to pull them faster. Posted: Fri Jan 26, 2018 1:35 am Post subject: Re: Syncro Chat: VC's, solid shafts, decouplers, AWD/4WD, etc. I see the VC made the way over the Atlantic and is used in some Jeeps. They call it "full time AWD"
The problem is, Jeep installed the VC into the main gearbox and the VC suffers from the heat. Posted: Thu Jan 25, 2018 1:35 pm Post subject: Re: Syncro Chat: VC's, solid shafts, decouplers, AWD/4WD, etc. Syncro fellers have been wanting for this diagram for 10, 20 years. I'll have to hunt around for some of the diagrams I and others used to compile going back to about '88 but in the 90's in earnest, and see if there are any similarities. The whole Vw vanagon VC system and how it works in the real world has always been a curiosity virtually from the day they were sold. After reading too many Vw promo lit. and technical testing pamphlets I had the impression even VoG was surprised at what it was or wasn't doing under different circumstances. But the diagram above is a nice general one. Posted: Thu Jan 25, 2018 1:10 pm Post subject: Re: Syncro Chat: VC's, solid shafts, decouplers, AWD/4WD, etc. oops yeah it's curve radius at speed. Sorry for making it MORE confusing. Syncro fellers have been wanting for this explanation for 10, 20 years. Posted: Thu Jan 25, 2018 12:28 pm Post subject: Re: Syncro Chat: VC's, solid shafts, decouplers, AWD/4WD, etc. Posted: Thu Jan 25, 2018 12:11 pm Post subject: Re: Syncro Chat: VC's, solid shafts, decouplers, AWD/4WD, etc. I'd say that this diagram describes highway speeds. Parking lot driving would result in a similar graph but the lack of rear wheel slip would just shift the red curve down to where the tip is at x=0 and y=0 (in other words, no forward torque). Posted: Thu Jan 25, 2018 9:27 am Post subject: Re: Syncro Chat: VC's, solid shafts, decouplers, AWD/4WD, etc. 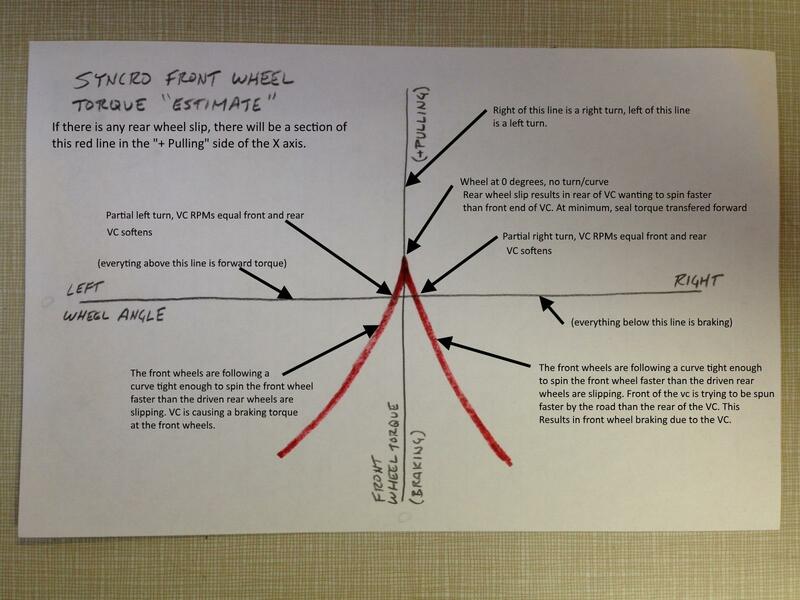 Raoul, your diagram is good to describe the relationship when the "geared" drivetrain puts the "rubber to the road". The horizontal line is important to understanding. Syncro fellers have been wanting for this explanation for 10, 20 years. EDIT I have understood this diagram correctly in the past but today read it wrong.... 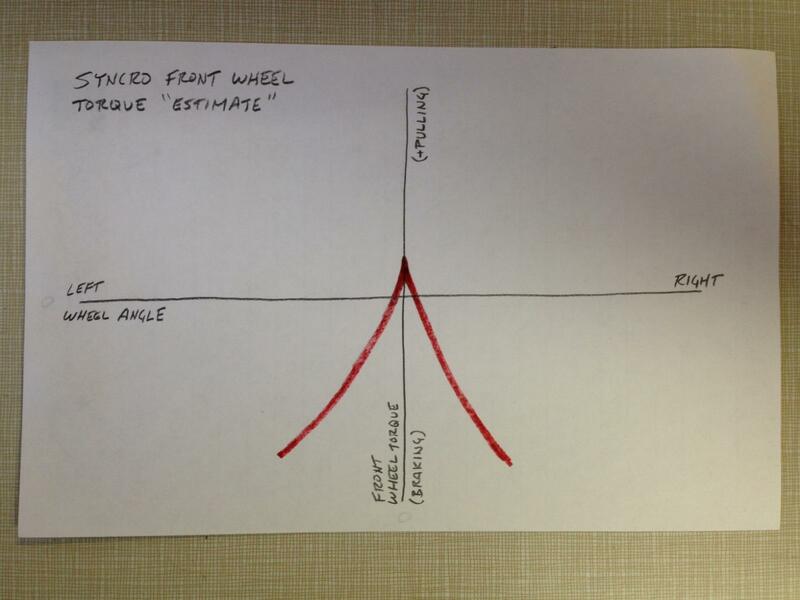 I'm trying to get Jon to add slip between tire and roadway into his understanding - fwd(drive) & backward (skid). You cannot have the steady state condition of tire speed = roadway speed when there is 80hp being expended. Lower speed maneuvering (parking etc) is below the horizontal. Highway driving is above the horizontal. Jon's explanations are all very good for describing the relationships "below the horizontal". Most vans don't get a lot of miles below the horizontal. Most of any vans miles are ticked away above the horizontal, where slippage cancels the binding. Posted: Wed Jan 24, 2018 3:08 pm Post subject: Re: Syncro Chat: VC's, solid shafts, decouplers, AWD/4WD, etc. 1. The motor of a Syncro w VC or solid shaft, can never power the front diff faster than the rear diff. 2. In a dry curve, front wheels travel a longer distance than rear wheels. 3. To power the front diff faster than the rear diff, requires a center differential. 4. A syncro does not have a center differential. 5. The front wheels don't need to travel faster than the rears to provide forward torque. EDIT: This is at highway speeds, not a parking lot. Posted: Wed Jan 24, 2018 2:54 pm Post subject: Re: Syncro Chat: VC's, solid shafts, decouplers, AWD/4WD, etc. This means the front wheels have to skid over the ground. It also means the rear wheels have to slip to match the front wheels skidding. There can be a curve radius, speed, power and surface adhesion where rears could be slipping and the fronts could be gripping 100%. At a tighter curve fronts would be pushed. At a lesser curve, fronts would pull. Holding everything else constant, the variable that changes the surface contact from "pushed" to "pulling" is the turn radius (steering wheel position). It's great to see you have added tire slip into your factors. When you start to consider slippage in both fwd and rearward directions (rather than the fronts being pushed ONLY) that may be the final step you need to understand the Syncro drive system. Posted: Wed Jan 24, 2018 1:53 pm Post subject: Re: Syncro Chat: VC's, solid shafts, decouplers, AWD/4WD, etc. Note in the following, the “transfer case” operates similarly to a Solid Shaft or hardened VC in a Syncro. On a dry pavement curve, a VC in slip mode is not able to power the front diff faster than the rear diff, in fact, in slip mode the VC can not power the front diff at all, because by definition, it is slipping. The transfer case on a part-time four-wheel-drive system locks the front-axle driveshaft to the rear-axle driveshaft, so the wheels are forced to spin at the same speed. This requires that the tires slip when the car goes around a turn. Part-time systems like this should only be used in low -traction situations in which it is relatively easy for the tires to slip. On dry concrete, it is not easy for the tires to slip, so the four-wheel drive should be disengaged in order to avoid jerky turns and extra wear on the tires and drivetrain. It cannot be used on-road because of the locked transfer case. the transfer case on the Hummer does not automatically lock the front and rear axles together. Instead, it contains a set of open-differential gears that can be locked by the driver. In open mode (not locked), the front and rear axles can move at different speeds, so the vehicle can drive on dry roads with no problem. Regarding RWD tire slip. IF the rear tires of a VC Syncro slip, the VC hardens, at which point front and rear tire slip equalize. When a VC hardens in a curve on dry pavement, the front diff can not spin faster than the rear wheels, and therefore a VC can not power the front diff fast enough to cover the front wheel distance over the ground. This means the front wheels have to skid over the ground. It also means the rear wheels have to slip to match the front wheels skidding. Posted: Mon Jan 22, 2018 9:37 pm Post subject: Re: Syncro Chat: VC's, solid shafts, decouplers, AWD/4WD, etc. Of course it's different. My point is that a partially deflated street tire when running at high rpm may not remain smaller in diameter after all. Posted: Mon Jan 22, 2018 10:40 am Post subject: Re: Syncro Chat: VC's, solid shafts, decouplers, AWD/4WD, etc. That's different. Those are bias ply tires designed to grow and alter the gear ratio as the car gains speed. Not to mention the 8-10PSI they ruun at or the elliptical shape they assume at 300MPH!! Steel belted radials are much more tightly held. How much will a Mickey Thompson drag slick grow? Posted: Mon Jan 22, 2018 10:17 am Post subject: Re: Syncro Chat: VC's, solid shafts, decouplers, AWD/4WD, etc. The slip depends on weight, tires, pressure, speed, street/pavement conditions, uphill-downhill, coupled-decoupled. The only for sure, there is slip. Totally agree. I uploaded this graph a year ago and posted it to the crosswind thread. I am thinking that the curve should look more like a parabola than a tent now (I'll need some quiet time to contemplate). Anyway, there are purposely no numbers on the chart because we don't even have a baseline for rear tire slip. More slip would shift the curve upward. Less slip would move the curve down. The top/tip/center of the curve (at x=0 location) is where the steering wheel is centered and driving perfectly straight. Turn left and the forward torque drops down and to the left. Turn far enough to cross the horizontal x axis (y=0) and you are into braking territory. Turn right and the forward torque drops to the right. All the variables Waldi listed are going to affect the shape and position of this curve. Posted: Mon Jan 22, 2018 7:43 am Post subject: Re: Syncro Chat: VC's, solid shafts, decouplers, AWD/4WD, etc. If some of you like to google translate this may be interesting. Funny is, VW/Steyer-Puch sayed the 4-wd is saving fuel. I never believed this, not had the practical experiance. The Syncro was able to do this maually with VC and decoupler 30 years ago. It seems most of ppl are not more able (why?) to drive manually. Posted: Mon Jan 22, 2018 5:52 am Post subject: Re: Syncro Chat: VC's, solid shafts, decouplers, AWD/4WD, etc. Good data Mark. Any chance you want to repeat it, but at 65 mph? Ha. I don’t think we will resolve how much the fronts do pull until we get some reliable tire slip data. Looking at you crazyvwvanman. Imagine straight line dry decoupled at 65mph. Rear tires under torque and experiencing 0.5% slip. Rpm difference at the VC would be 18 rpm. Now pull the knob and couple it. VC rpm difference can’t stay at 18 so it drops (0-5rpm?) and the rear slip is decreased while slip on front tires increases as the front pulls and removes some of the load at the rear. Perhaps .2 slip front and .3 slip rear? And yes, the front torque will drop when entering a turn and cross over to negative if the curve is sharp enough.